It is always sad when a World Cup ends. No more matches at all hours of the day, no more constant media coverage, no more excitement with new heroes emerging daily from obscurity. This year’s Women’s World Cup was as entertaining an affair as we have seen from this, or any other tournament, in quite some time. Unexpected teams rose to the highest echelons of the sport, smashing the previous hierarchy and announcing an exciting future for the sport. So before we let them drift out of the rear view mirror, let’s take a look at the stand-out performers in the 2011 Women’s World Cup. ESPN’s commentators were quick to claim that Solo is “one of the best goalkeepers in the women’s game.” They were being polite. She is the best. Hands down. If not for some late nastiness with Josefine Oqvist of Sweden in the third place game, Bompastor might have been my favorite non-American player of the tournament. She has silky skills, the grit and toughness of a woman much larger than her 5’4″ frame, an incredible competitive drive and always wears a smile on her face. Simply put, she plays the game the right way (99% of the time). Captain America had an amazing tournament. Not only is her positioning near perfect, but she does not seem to have lost a step over the years. Her performances are made even more impressive given the shakiness of her partner, Rachel Buehler, and Amy LePeilbet out on the left. All the talk coming in was about the contrast between the quality of France’s attack versus their porous defense. 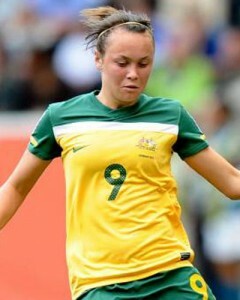 While the Les Bleus back line was caught out on occasion, Laura Georges was a rock. Standing 5’8″, Georges showed great ability in the air as well as elite speed for a defender, covering fleet-footed attackers with aplomb. And she’s only 26, meaning that there should be at least one more World Cup in her future. The no nonsense fullback does all the hard work on defense, yet somehow seems to live in the opposition’s half of the field. Between Kinga and her bookend, Sameshima, it is no wonder Japan was able to maintain attacks and possess the ball high up the field. The free kick specialist of the tournament, Miyama bagged two goals to go with four assists, tying her with Sawa and Marta for involvement in the most goals. Not bad company. Add her quick feet and excellent close control and it there is no doubt why Miyama terrorized so many rightbacks this summer. At tournament’s end, Sawa, the Japanese captain, has tallied 170 caps and 80 international goals over a career spanning five World Cups. American fans already knew her from a spell with the Atlanta Beat in the WUSA days. Sawa was the heart of the Japanese team, dominating the middle of the pitch with her strength on the ball, incredible vision and boundless creativity. While petulant stars like Marta or Prinz pouted and showed negativity when things were less than ideal, Sawa was the portrait of a positive leader who makes everyone around her better. The daughter of Algerian parents, Necib has already been labeled the female Zinedine Zidane. Not bad for a 24-year-old whose creative and vision saw her rise to the top of a French team already chock full of playmakers. With fast, talented partners in Camille Abily, Elodie Thomis, Gaetene Thiney and Elise Bussaglia swarming around her, France’s no. 14 was free to pick her spots and serve balls into dangerous areas. France is on course to mature into one of world soccer’s elite, and Necib will continue to grow as the most influential piece in coach Bruno Bini’s arsenal. The tall, lanky German outside midfielder had a strong tournament, despite her team’s early exit. While her size makes her a dangerous option in the air, it is her agility on the ball that dazzles, as she as nimble as players more the six inches shorter. While Birgit Prinz languished on the bench and Inka Grings struggled to cover herself in glory, Garefrekes toiled throughout 120 minutes against Japan before the Germans ultimately succumbed to the eventual winners. Courage, power, determination. 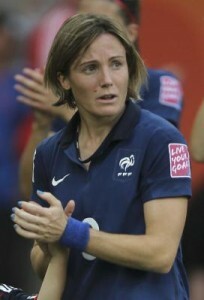 Abby Wambach single-handedly willed an under-skilled US attack forward in the late rounds of the tournament. Just when the US seemed set to flatline against Brazil, Wambach scored the now infamous towering header to send the match into penalty kicks. She struck again to provide the winner against France and her extra time tally in the final would have been enough to lift the cup if not for Sawa’s heroics. While she did not get the trophy she so desperately desired, Wambach proved her merit to an international audience and can now fade into the international sunset with 162 caps and an astonishing 122 international goals to her name. While the world’s best player turned up the style early in the tournament, it is her off the ball antics, cynical dives and berating of officials that has the world talking. There is no doubting Marta’s quality, (dazzling) but in a Brazilian setup that lacks structure and backing, the team needed better from their leader. Marta’s childish remonstrations and frustrated body language towards her teammates simply will not cut it on a team that, on paper, should be one of the best in the world. Fortunately, she is still 25 and if she can maintain her health and form, she will be around to lead Brazil on another assault in the 2015 World Cup. That is good news for Brazil because when she is on form, there is no one in the world who compares. Entering the tournament, the knock on the Japanese goalkeeper was her ability to claim the high ball. At no point did that concern become reality and in a quarterfinal where Germany’s Nadine Angerer came up small and a semifinal where Sweden’s Hedvig Lindahl’s flap gifted Japan the winner, Kaihori’s hands remained steady. Kaihori still doesn’t have Hope Solo’s range or athletic gifts, but she is a solid number two in the world. Unlucky to play second fiddle to Bompastor, Sameshima possesses all of the skill, speed and tenacity you could want out of a fullback. Her runs often stimulated the Japanese attack, and her aggressive positioning high up the pitch pinned back opposing attackers. With Swedish players dropping like flies around her, Rholin stepped into the captaincy and led her team to the third place podium. Stout as any in the back, Rohlin is always a danger to latch onto a set piece. Solid if unspectacular, Kumagai was quick to close down attacks and outlet to Sawa, Ohno and Miyama in the midfield. A team with Japan’s percentage of possession always risks the counterattack, but Kumagai held the backline together throughout the tournament, limiting the number of quality chances the eventual champions gave away. As the only member of the US starting XI to play abroad, Krieger (who plays in the German league) looked comfortable throughout the tournament. A strong distributor out of the back, Pia Sundhage showed great faith by allowing her to take the final penalty kick against Brazil, and she dutifully buried it to send the US through to the semis. Perhaps the most skilled member of the United States team, one can only imagine how much move havoc she could have caused had she been deployed more centrally. She is still only 23-years old and will likely be one of the leaders for the red, white and blue in 2015. The powerful, uncompromising Scott was England’s midfield engine, doing both the dirty work of ball winning and providing distribution around the park. She also chipped in with two goals. Faced an uphill battle given the injuries to Caroline Seger and Nilla Fischer, but Dahlkvist showed up big for the Swedes. Not only did she find her way onto the scoresheet, but also let acted as the physical enforcer for a depleted Swedish midfield. A pure winger, O’Reilly’s pace up and down the touchline terrifies opposing defenses and her service into the box is excellent. On a team with better play in the center of midfield O’Reilly’s work would yield better results. Perhaps the most complete striker in the tournament, Schelin can do it all, whether it is in the air, on the ground, or moving without the ball. Unfortunately for her and Sweden, coach Thomas Dennerby changed formations for the semifinal against Japan, dropping to a 4-5-1 and taking Sweden completely out of their game. Marta gets much of the praise as the leader of Brazil, but as far as dangerous, attacking play goes, there are few better than Christiane, who remains lightning-quick even with the ball at her feet. Always the first player to spur the counterattack. When you captain your team to World Cup glory all while scoring the most goals in the tournament from midfield and making all of your teammates better around you, you are hands down the best player in the tournament. And you are Homare Sawa. Is there really any doubt about this one? The only real question to ask is why coach Pia Sundhage benched Megan Rapinoe entering the tournament. Whether it was the final where she started or the multiple occasions where she breathed life into the American team, Rapinoe’s contribution to the US push to the finals is undeniable. The most aggressive player going forward for the Americans, Rapinoe will long be remembered for her cross to Abby Wambach against Brazil. But do not forget that she also sprung Alex Morgan for her goal in the final. The US was a different team when she was on the pitch and one can only wonder why she was not on from the beginning of every match. Another no brainer. Japan’s manager, Norio Sasaki, treated the world to a delightful display of top quality, passing soccer. His team was head and shoulders above the field when it came to controlling possession and moving without the ball. While opposition teams threw size, strength and speed at his charges, the Japanese were simply too good and Sasaki’s side ran out deserved winners. While she did not get on the scoresheet in this tournament, the 20-year-old Popp has scored nine times in her first 14 appearances for Germany. Between now and 2015, Coach Silvia Neid (should she retain her post following the disappointment of a quarterfinal exit on home soil) will be forced to take her team through a changing of the guard, with the imminent international retirements of all-time leading scorer Birgit Prinz, Kerstin Garefrekes and Inka Grings. The goals will need to come from somewhere and the 5′-9″ Popp has the physical tools, technique and pace to become the next great German striker. A delicate chip in the semis against France and a screamer in the final against Japan. Alex Morgan has arrived and can no longer be looked at as a late game substitute. Morgan is part of the new class of female American soccer players who combine superior technique with the traditionally high American standards for fitness and athleticism. Without a clear cut successor to Abby Wambach in terms of an aerial presence for the US and the clear swing of the women’s game towards a more technical, possession minded approach, the future of US soccer should belong to speedy, talented players like Morgan, Amy Rodriguez and Lauren Cheney. Not only did Ford win the award for the best young player of the tournament, she did it at age 16, so get used to seeing her face as it will be around for at least two if not three or four more World Cups. With Japan, France and Sweden closing the gap on the United States, Germany and Brazil, parity within the women’s game is coming quickly and the “Matildas” could be the next squad to make the jump into the world’s elite. Australia’s sporting culture has always produced athletes galore, but in players like Caitlin Foord, Collette McCallum and Leena Khamis, it is clear that those athletes are now playing soccer. Following their championship in the 2010 Women’s Asian Cup, Australia got out of the group stages this summer and another four years could see them break into the tournaments final four. Huff and puff as they might, France just couldn’t blow the house down. Whether it was Germany, the USA or Sweden, all of France’s slick soccer took place outside of the opponents 18 yard box and striker Marie-Laure Delie did not possess the ability to open up a defense. Enter Elodie Thomis. The 24-year-old already has 58 caps and 17 international goals to her name, yet it was not until the late stages of the tournament that coach Bruno Bini noticed how easily the fleet-footed Thomis could get in behind a defense and latch on to a through ball from Abily, Necib, Souyebrand, Bussaglia or any of the other excellent French midfielders. By 2015, Thomis should cement herself as an automatic starter for Les Bleus. Insightful, informative and not afraid to pull any punches. The author obviously knows soccer and what he likes in soccer and it’s players. You may disagree with some of his choices but I feel you would come around to Eli’s way of thinking in a one on one. Should be writing for SI but might have to tone it down a little. Great blog!